Ham Ho tourist spot (khu sinh thái Hầm Hô) with beautiful landscape and fresh air is an attractive tourist site in Binh Dinh (Bình Định). 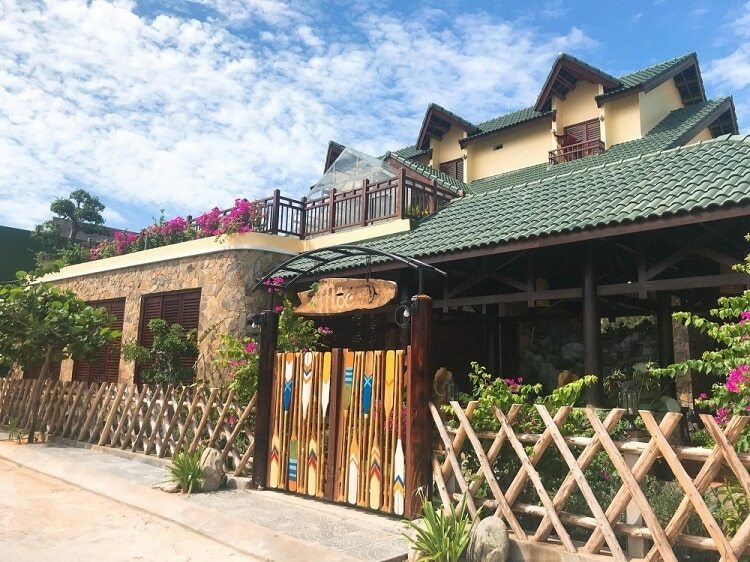 Located in Phu Lam (Phú Lâm) Village, Tay Son (Tây Sơn) District, this site is attracting a large number of domestic and foreign visitors who come to explore the peaceful beauty of this beautiful place. Ham Ho tourist spot or Ham Ho nature reserve has been well-known for its natural beauty surrounded by impressive streams, mighty mountains, and big trees, which create a poetic view of Ham Ho. Coming to Ham Ho, tourists and travelers can take part in many outdoor activities. Therefore, to make your visit to Ham Ho nature reserve more meaningful and more memorable, you should travel here between January and March. During these months, the average temperature is about twenties Celsius, and Quy Nhon (Quy Nhơn) has a little chance of rain. If you come later during the year, the weather will be hotter. But if you do not mind the hot weather, the summer months are also the best time for you to visit Ham Ho tourist spot because fewer visitors are coming during these months, so you are likely to get an affordable price for flights and hotel. Ham Ho tourist attraction has thick verdant forests, innumerable rocks with different shapes, high mountains that reach to the sky and cleaning water that flows continuously. It is not surprising when that unique beauty and picturesque views have made Ham Ho become a charming tourist spot in Binh Dinh that tourists should travel. Thanks to many investment projects built on this site such as parks, guest houses, sports grounds, etc. Ham Ho nature tourist spot is increasing the number of visitors and tourists with more than one thousand turns of tourists going to Ham Ho every day. 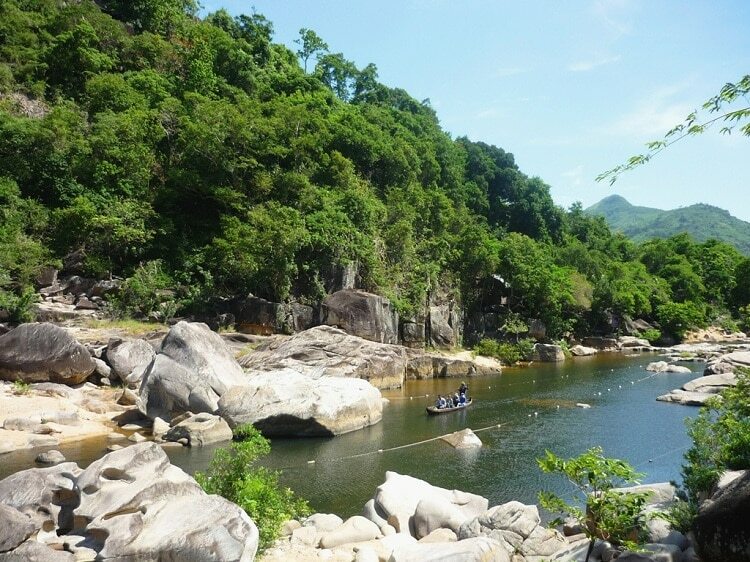 Located around 50km from Quy Nhon City, it is easy for tourists to reach this site by car. 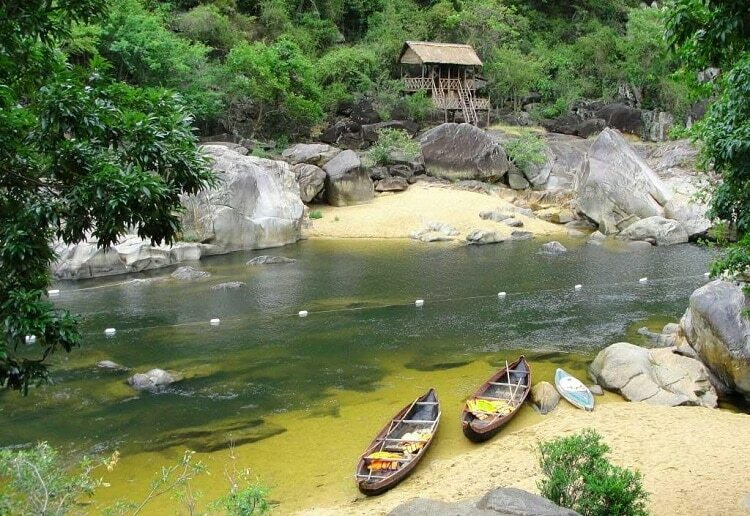 From the center area, tourists in a group of six or seven people can sit in a small boat and enjoy the views along the river banks that are a dense forest with high cliffs and some rocks with different strange shapes. You should ask the boatmen to stop at interesting stone places such as Flying Fish Stone, Chess Stone, and the Gates of Life and Death which are all must-visit places in Ham Ho. Ham Ho has a considerable number of fishes; therefore, it is a great idea for you to go fishing. So, when you visit Ham Ho, you should bring a fishing rope with you to have great and memorable experiences. Although not many people come to Ham Ho in flood season, this time has the most number of fishes. It is the reason why people call this time of the year as the Contest of Fishes. It is said that the fish winning the contest will become a dragon. Tourists coming to Ham Ho often spend at least one day to explore all the interesting places at Ham Ho. Besides the stone sites, tourists can also visit Ham Ho dam, Hon Chuong (Hòn Chuông) and Hon Bong (Hòn Bóng) with poetic views that make more and more tourists coming here to relax and take beautiful photos. Besides fishing, tourists can take part in many outdoor activities like kayaking or swimming. You can easily hire a hammock, life jacket and kayak leasing service with the fee of 15,000 VND – 100,000 VND. Ham Ho Nature Reserve has developed many tourist services such as homestays and restaurants to serve tourists and visitors coming to Ham Ho. In a small restaurant like Nha hang Hoa Loc Vung (Nhà hàng Hoa Lộc Vừng) with 300 seat capacity always offer many rustic specialties of Binh Dinh and seafood of Quy Nhon. Furthermore, you can stay overnight at Ham Ho Homestay that features many convenient services with an affordable price. Ham Ho Tourist Spot is also an ideal campsite for tourists who want to spend time with their friends or their family. I hope that you can find useful information about your trip here. If you have any questions or opinion to share, you should feel free to leave in the comment section. We will answer as soon as we can. To know more about Vietnam travel, visit our Vina homepage.